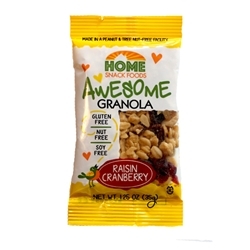 This AWESOME Granola is free from the Top 8 Allergens. Perfect for parfaits, salad bars, snacks and cereals. Can be used as an ingredient for baking and main dishes. Made and packaged in a nut free/tree nut free facility. Kosher Gluten Free. Soy Free. Smart Snack Compliant.